This need was magnified when realizing the space was limited due to ceiling height – or lack thereof. “The home features a Mid Century Modern style and there is a loft above the kitchen, which leaves us with exactly 7-foot-tall ceilings,” he says. 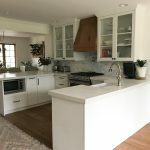 “Therefore everything had to work out perfectly.” So in effect this kitchen was a complete remodel that required new walls, flooring, ceiling, electrical, cabinets and appliances. Enter IKD’s design team who worked with Todd to navigate IKEA sales, IKEA pricing and available door styles, including the brand-new VOXTORP door style,and the RINGHULT door style, to complement the SEKTION kitchen line. For perspective into the design challenge, space was at such a premium in this small kitchen that incorporating the pantry alone was a tremendous obstacle.“Getting the pantry into the kitchen was a huge challenge since we could not lay it flat and lift it up due to its height,” Todd says. To remedy this, the contractors actually had to cut into one of the cased openings to bring it into the design. However with IKD’s design guidance and IKEA products, ultimately the kitchen was not only completed within budget, but features unique storage solutions with the clean, updated look the client desired. With such a unique design challenge, IKD literally needed to think outside the box. 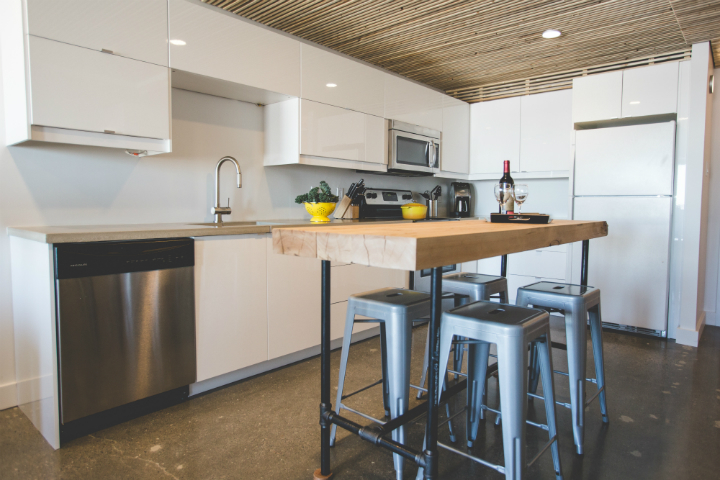 “All of the IKEA kitchen space-saving ideas presented were taken into consideration,” Todd says. For instance, IKD recommended incorporating fully extendable drawers, which suit the need for space in a smaller working kitchen. Therefore, all of the higher and lower portions of the cabinets feature a combination of MAXIMERA and UTRUSTA drawers, as well as UTRUSTRA shelves and hinges, providing ample space-saving storage options. 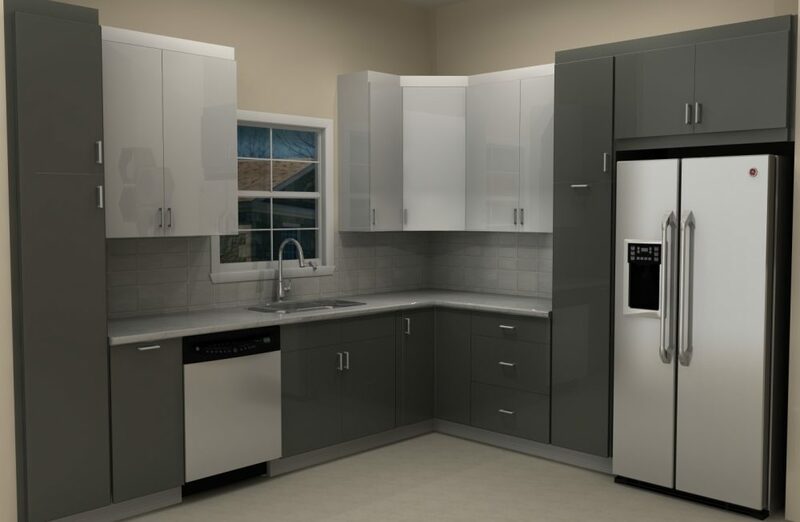 One of the other design desires was to give the space a sleek, modern look by picking the right cabinet door styles from IKEA. 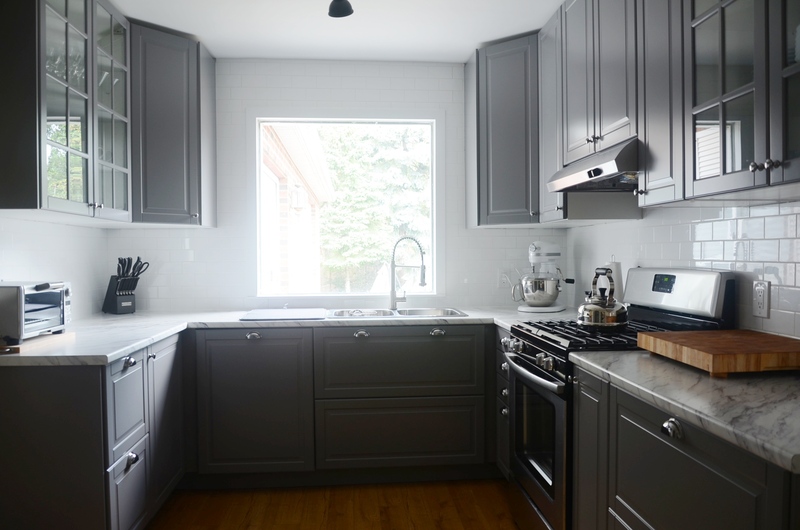 “I definitely wanted this kitchen to have timeless style, be highly functional and require very little maintenance,” Todd says. He ended up selecting brown VOXTORP and white RINGHULT cabinet fronts, and light gray BROKHULT drawer fronts to complement the walnut-style SEKTION cabinets. “The VOXTORP was a brand-new front that had come out after working with IKD. There were no good examples of completed kitchens to look at since it was so new, but they turned out way better than I expected!” he says. 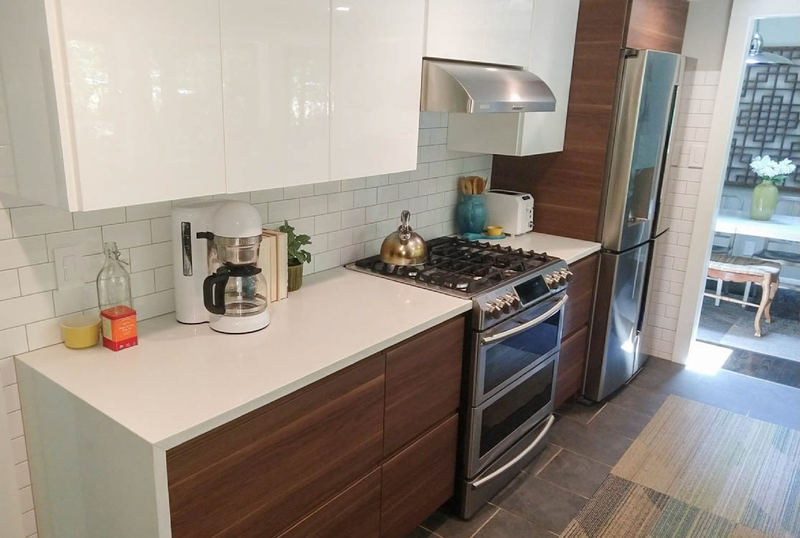 The cabinets are complemented by stainless steel GREVSTA toe kicks and light-colored quartz countertops, which were supplied from a vendor through the contractor. Todd selected the IKEA VOXTORP and RINGHULT cabinet fronts and SEKTION cabinets because the product line checked three key boxes on his wish list: Great pricing, known quality and the modern design style he needed. Todd explains: “I spend a lot of time on HOUZZ and Pinterest so I had a clear vision of what I wanted. With this kitchen I knew that details are important and the closest IKEA is two hours away. I did not want to be making trips back and forth constantly. I wanted to go once, order, get them delivered and be done with it.” He notes that he bought a lot of the fixtures from Amazon, which included open box items to save on cost. 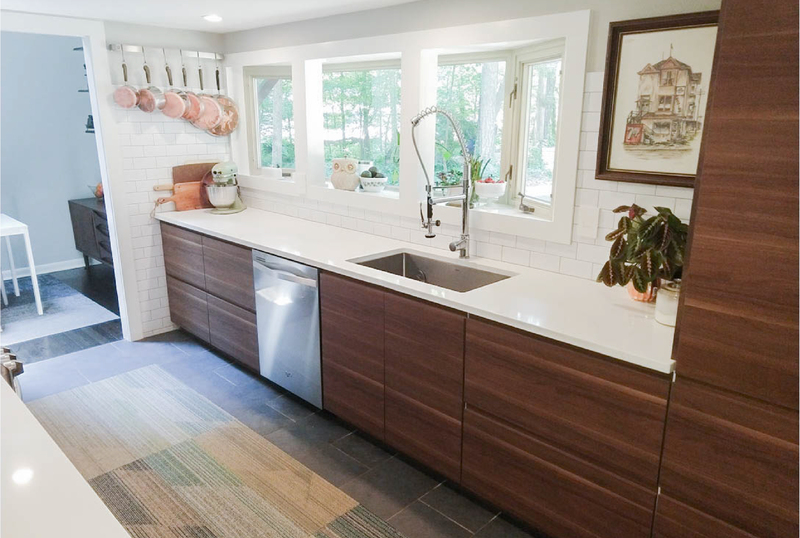 To make the process go smoother, he also hired a contractor – Hollow Rock Construction in Carrboro, North Carolina – although he assembled all of the cabinets and hung all of the doors and fronts himself. “The contractor set the boxes on the wall, and they were fantastic,” he says, “and it was their first IKEA kitchen since they usually build custom cabinets.” He points out that any future IKEA remodelers should anticipate delays when getting IKEA deliveries and plan for returns and exchanges. And lastly, building out an entire kitchen’s worth of cabinets took a few weeks but was an enjoyable and satisfying experience. Thanks Todd for these insights into your IKEA design experience and for these space-saving tips! We designed completly online with Todd. His kitchen turned out beautifully and we’re happy to be parf of it. How Much Will an IKEA Kitchen Cost? 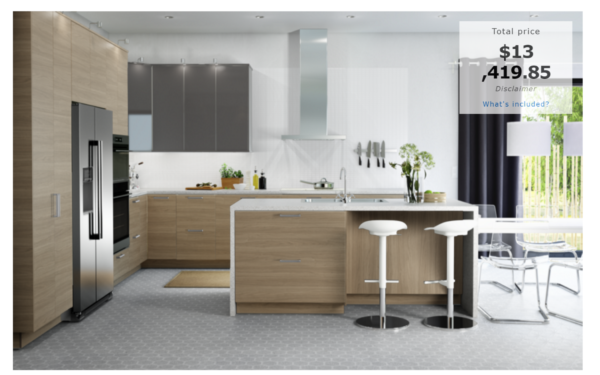 I can guarantee you this IKEA kitchen costs more than $13,419.85 USD in the real world. 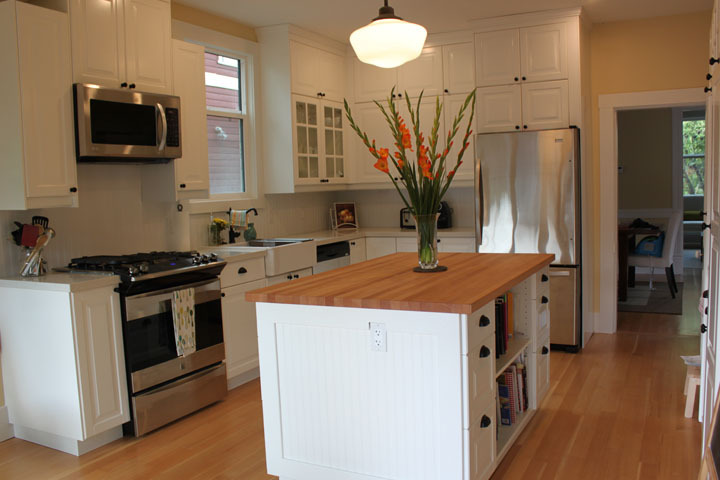 What’s the first thing a homeowner wants to know about remodeling their kitchen? How much it’s going to cost! 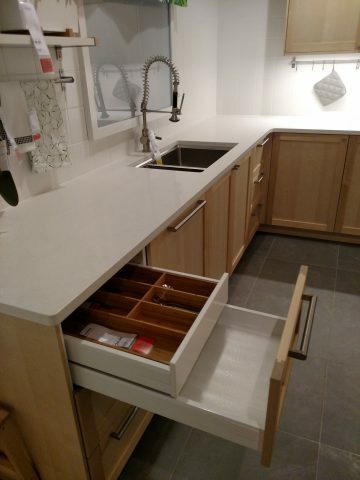 IKEA kitchen customers are no different. 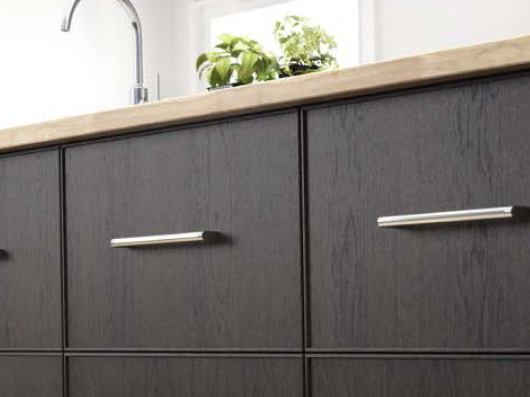 If you’re like most of our customers, IKEA kitchens appeal to you because of their price. 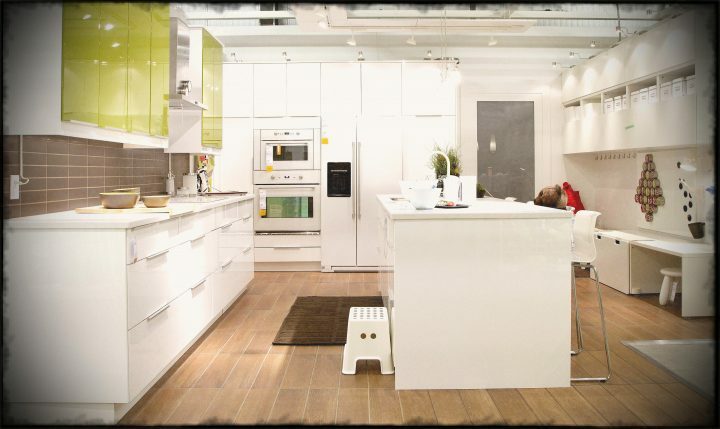 You’ve done enough shopping around to know IKEA offers the right blend of affordability and quality for your kitchen. But do you know how much an IKEA kitchen will really cost for your home? This hack is perfect for filling a “large” empty space in a cabinet run between two walls. These spaces are covered with narrow fillers which are easily cut from larger panels. What if you have 5” or more of leftover space in your kitchen? Wider leftover spaces can be covered with fillers, but large fillers don’t look professional. 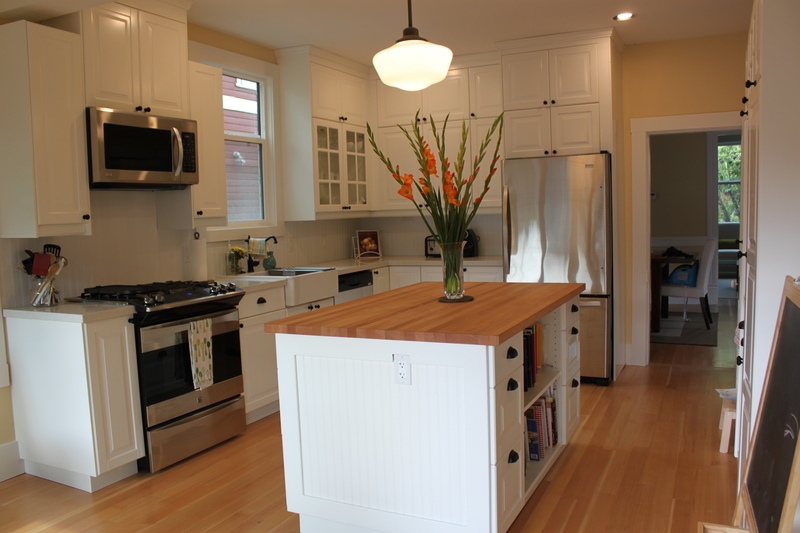 If more than 5” is leftover, you can put this space to work by inserting a custom 5” wide cabinet. This applies to both wall and base cabinets. IKEA kitchen cabinet doors start at 12” wide, so where are we getting the 5” door? We’re taking a low drawer front and placing it vertically. The low drawer front is 5” high, so when you rotate it 90° you have a 5” wide door. Unfortunately, IKEA does not sell a 5” wide cabinet. IKEA sells only eight widths of base and wall cabinets. The narrowest cabinet is 12”, and the widest is 36”. The cabinet sizes in between increase in increments of 3”. Whether you live in Canada, Australia, the United Kingdom, or Europe, IKEA has everything you need for a great kitchen. And IKD can design it for you! We understand that different countries have different priorities for their IKEA kitchens. For example, an Italian kitchen has concealed appliances. American kitchens have giant refrigerators, but in Europe, they’re smaller and hidden behind doors. It’s why IKEA’s METOD line in Europe and Australia has such different cabinets from SEKTION. What do IKEA kitchens look like around the globe? The average kitchen ceiling height is 96” high. Most modern refrigerators are 84” tall. What is the size of the gap between them? And more importantly, what do you do with the space? Most modern kitchen appliances don’t announce themselves. The design trend right now is for appliances to look concealed and built-in. The focal point of modern kitchens is typically not an appliance, but instead a stunning light fixture or well-designed kitchen island. American refrigerators, however, always buck the trend of concealed appliances. While Europeans prefer counter-depth refrigerators that can be covered with a large cabinet door, American refrigerators are typically much bigger. The result? They end up sticking out like the proverbial sore thumb. A good IKEA kitchen designer will soften the luck of a bulky refrigerator by enclosing it with a cabinet and side panels. That works well when your refrigerator is 70” high or less. But like we said, many modern refrigerators tend to be 84” high. The space is too small for full-sized cabinets. Anthony and his wife Daniela’s newly purchased 1950s home needed a lot of renovation before they could move in. They chose IKEA for their kitchen and IKD for their kitchen design, to help them stick to their budget and their timeline for moving in. When I interviewed Anthony, he and his wife had been cooking in the kitchen for three weeks and were deeply in love. Toe-kicks aren’t just for under the kitchen cabinets anymore. IKEA says you need to think bigger! Embrace the new year and the new SEKTION kitchen line and you’ll discover another use for toe-kicks. Or as IKEA calls them, plinths. ICYMI: Photos of IKEA’s new kitchen line, SEKTION, are out. Not even a month has passed since you packed up the ornaments and took the elf off his shelf, but it’s Merry Christmas for IKEA fans all over again! In just a few days you’ll be able to give your kitchen the gift of SEKTION. Are you as excited as we are? 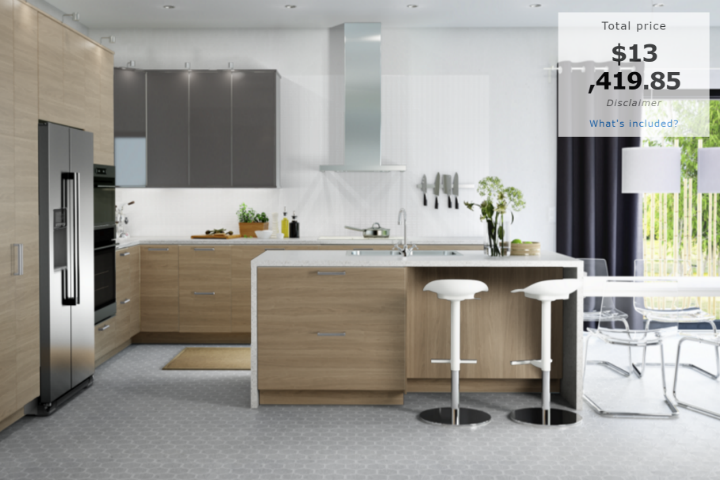 We’ve discussed how IKEA’s SEKTION will make your kitchen look slimmer and sexier by hiding your appliances. We also heard you liked drawers, so we talked how SEKTION puts drawers INSIDE of drawers. We even went undercover to photograph sneak previews from IKEA kitchen showrooms. But now, we have the hard facts and data. Our IKEA kitchen blogger has gone AFK (away from keyboard) in pursuit of SEKTION intelligence. 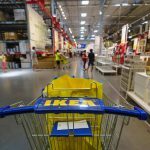 There are three more weeks until IKEA officially unveils SEKTION, its new kitchen line that’s replacing AKURUM in North America. IKEA has been so secretive about SEKTION that IKEA fans have been desperate to know what this new kitchen line could mean for them. IKEA kitchen customers and fans are eagerly awaiting the arrival of SEKTION..but wait. Aren’t IKEA showrooms already setting up? Why yes, they are. Your IKEA kitchen blogger does leave the safety of his office now and then to gather real, in-the-field intelligence. Intelligence that can only be found behind the heavy plastic sheet hiding IKEA kitchen showrooms as they get set up with SEKTION. Hey, we go the extra mile for our customers! Have you been so busy Christmas shopping and cookie baking, you forgot to decorate your kitchen for Christmas dinner? Don’t worry. There’s still time to get to IKEA for the last-minute decorations you need. Each year IKEA has a winter holiday section on their site. You can catch some Christmas spirit just from looking at the photos.